Some of the best products launched by Sony include their wonderful TV sets that are capable enough to serve viewers with best quality videos. If you have installed any of the latest models of Sony TV series, then you might be thinking to watch your Sony camcorder recorded videos on it to enjoy wonderful video quality. Sony TV provides amazing clarity for videos with millions of colors per frame and hence users cannot stop themselves from watching classy videos appearing on screen and on the other hand Sony Camcorder can capture any of your real world moments in form of videos that can be later viewed on Sony TV. Sony Camcorder is considered as best tool to capture videos because it has never caused any decay in quality of videos as well as still photographs. This camcorder to save videos in some specific formats and they are most of the time not acceptable by all other devices. In this world of entertainment, no one would like to stop enjoying video collections just because of unsupported video formats. Hence it becomes important to search for some other suitable options. In case if you have a Sony camcorder with you and wish to share your recorded videos on other devices then you need to convert those video formats into other compatible file formats. some of the most popular formats for conversion results are M4V, MPG, VOB, WMV,ASF, MPEG-1, MPEG-2, FLV,AVI,MKV and M2TS etc. whereas formats for widely accepted formats for Audios are OGG, WAV, AIFF, WMA, AMR, MP3, FLAC etc. In order to convert your videos from Sony camera supported file formats to other formats, you need Sony Video Converter. 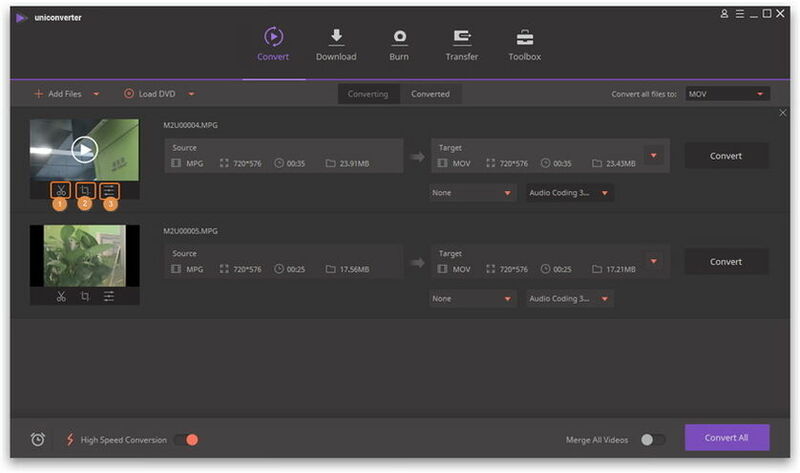 And the best thing to know about these converters is that they also allow you to edit videos so that something creative can be generated at output. One more major reason to convert these video files is that it is not possible to save all recorded videos on the limited memory space of Camcorder; transferring files to other devices like TV, PC or Mobile phones will help your camcorder to get free space available for future usage. 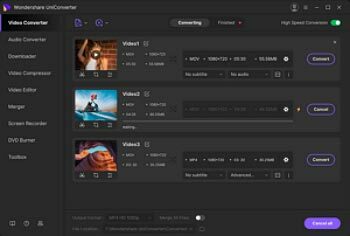 An effective video converter software or application will allow you to trim the length of recorded videos up to your desired size as well as make adjustments for contrast, brightness as well as saturation. Although there are so many conversion software available online that can assist you to get your video files converted but users always desire to have lossless conversion so that quality of videos can be preserved as it is. 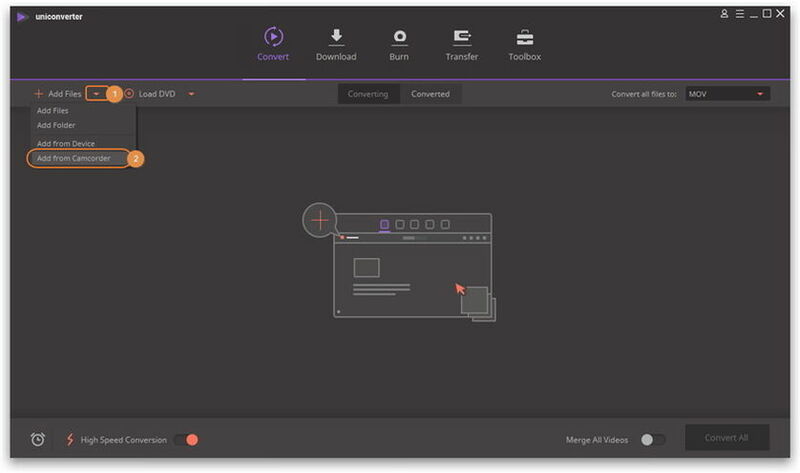 Wondershare UniConverter (originally Wondershare Video Converter Ultimate) tool provides you best platform for converting videos from Sony generated video format to other suitable file formats. The quality of videos will never be decayed after this conversion and it will also help you to edit your videos with its interactive and user friendly tools. Wondershare UniConverter (originally Wondershare Video Converter Ultimate) can be installed easily on any compatible device and it will allow you to do unlimited conversions every day. This tool is used by professionals too just because of its quality conversion results and you will be glad to know that there is no need of learning any specific skill to operate this tool as it is easy to use and is user friendly. 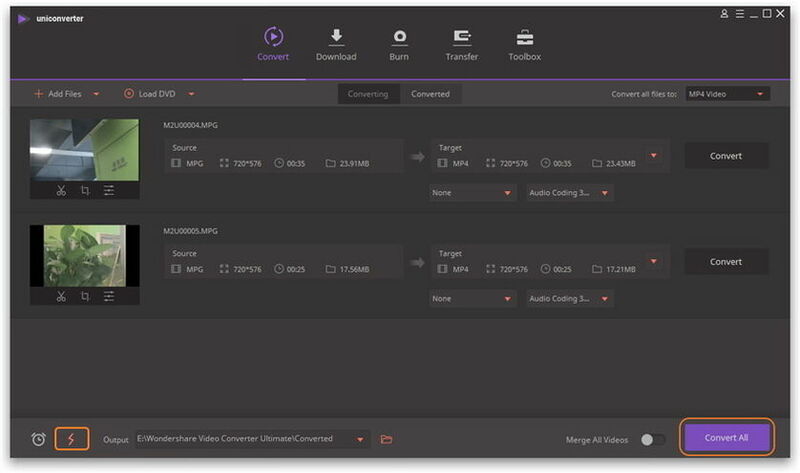 You might be thinking about how to convert Sony camcorder recorded video into any other format using Wondershare UniConverter (originally Wondershare Video Converter Ultimate). Here you will get complete information. Step 1 Upload your Sony camcorder video to the converter. Download the Sony camcorder video converter firstly, and install it on your computer. Then click the inverted triangle beside Add Files > Add from Camcorder to open the pop-up window from where you can find all the videos in your camcorder. Check the target video and click Add to Convert List to add the video to the converter. 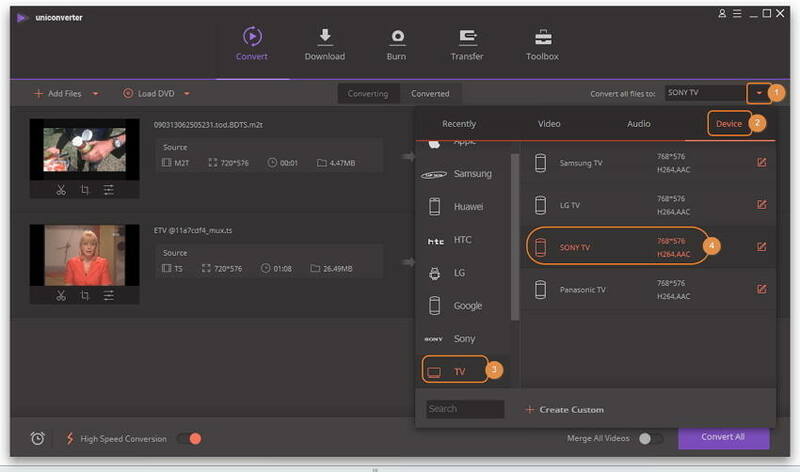 Click the drop-down icon beside Convert all files to: to enter the drop down list of the output format, select the target format Sony TV from Device > TV. If you want to edit the Sony camcorder video before the conversion, you can click one of the three buttons listed as below to edit your videos, like trimming, croping videos, applying effects, adding subtitles, etc. Step 4 Convert the Sony camcorder video to Sony TV supported format. Finally, click the Convert All button at the bottom-right corner to start converting the Sony camcorder video. Just follow the steps on part 3, only the step 2 is different, you can select your target format as you want from the different categories: Recently, Video, Audio, or Device.